Posthuman creator Gordon Calleja wants to create a game where the outcome "depends completely on the perspective of the players." 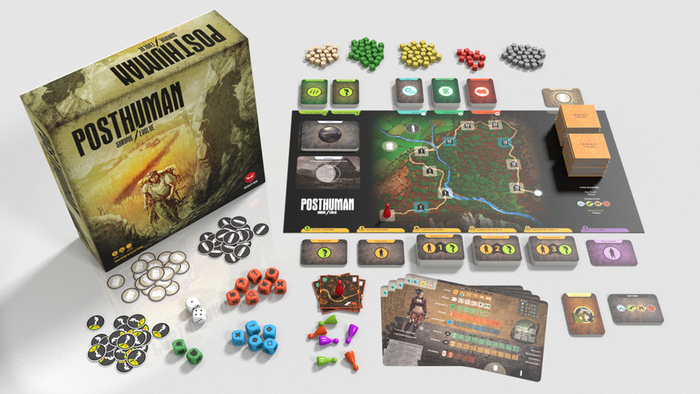 You may recall that we recently reported on the success of Posthuman, a post-apocalyptic board game that hit Kickstarter last week. The game impressively reached its $27,000 funding goal in a little more than 12 hours. Since then its campaign has continued to flourish and (currently) has managed to draw in nearly 2,000 backers and raise a whopping $124,000. It's a success that, for many, was unexpected. In fact, no one was more surprised than the game's creator. "While we were quite hopeful that the game would fund, we didn't expect it to fund so quickly," said Posthuman creator Gordon Calleja. "My secret super-optimistic estimate was reaching the funding goal in a week, not 12 hours." Calleja attributed the game's swift success to a number of factors, though most primarily to the hard work of his colleagues at Mighty Box Games. "The guys at Mighty Box are tireless perfectionists. They spent countless hours polishing every bit of content we put out there. We also do a lot of research on what's been done before and do our best to improve on it." Getting to the core of Posthuman's success though, Calleja would likely point to the vision of the game itself. Setting aside the continued popularity of the post-apocalyptic genre, he believes it possesses a lot of potential appeal for gamers looking for a tabletop experience that's a bit more open-ended when compared to what others offer. "Too many story-based games are based on a narrative scenario set out by the designer which the players follow and activate one of several possible endings. Such games bore me to death," he said. "In Posthuman you can either get a clear win as a human by completing ten zones on one journey track or, if you choose or are forced to turn into a mutant, you can win as a group of mutants and are denied the satisfaction of the individual win. There is an ambiguity about whether this is an actual 'win' or a denial of the win to the human players. And it's interpretation depends completely on the perspective of the players." We'll be interested to see, as its Kickstarter campaign continues rolling forward, just how deeply the vision of Posthuman continues to resonate with tabletop fans. Considering the fact that game has already managed to raise nearly five times its original goal, we won't be surprised to see it rise even higher.